One of the most common forms of arthritis, osteoarthritis, affects 27 million Americans. Osteoarthritis is often referred to as “wear and tear” on joints in the body and is generally accepted as part of the aging process. 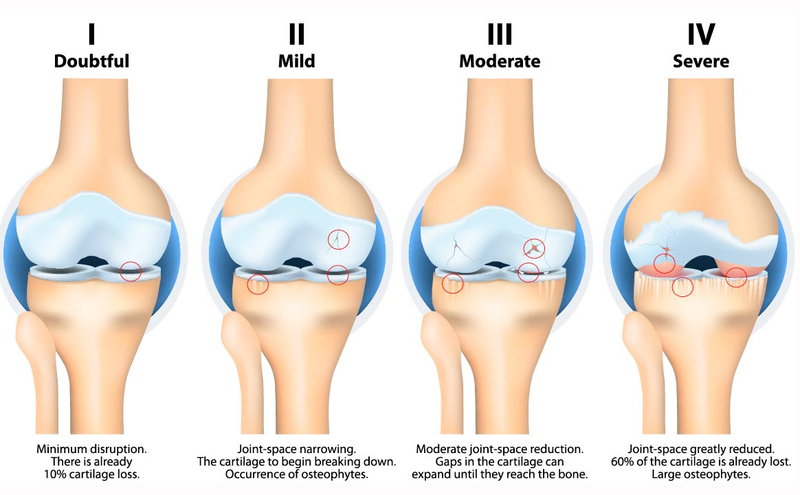 Osteoarthritis is caused by the breakdown of natural padding (cartilage) in joints like knees, hips and other weight-bearing joints. Symptoms of osteoarthritis don’t just appear overnight. They come on gradually and while it’s mostly people over the age of 60 that deal with OA, we’ve also seen patients in their mid-20s and 30s suffering from OA. Symptoms include pain, stiffness, mild swelling and cracking in the affected areas. To receive an accurate diagnosis of osteoarthritis, your doctor will need a detailed description of your symptoms, their severity, frequency, and location. From there, your doctor should examine your joints and order x-rays to get a complete picture of your joints. Blood tests may also be ordered to determine if other forms of arthritis may also be causing you pain. Depending on the level of severity of your osteoarthritis, there are many different treatments. Those with mild OA can usually manage the pain and inflammation with over-the-counter medications like ibuprofen. Your doctor may also order physical therapy to help strengthen the muscles around the joints. Your physical therapist may also use hot or cold presses to help ease your pain. For those with more severe osteoarthritis, your doctor could order steroid shots for your joints, and in the most severe cases, invasive joint replacement surgery that can take several months to heal is recommended for treatment. Stem cell therapy is quickly becoming a more and more popular alternative to osteoarthritis-related joint replacement surgery. Stem cells neutralize inflammation and accelerate healing. They have the potential to regenerate injured cartilage tissue, tendons, bone, muscle, ligaments and vertebral annular disc cartilage. To regenerate your body, stem cells find the damaged tissue and have the potential to initiate its repair or regeneration. This technique begins by harvesting a patient’s own stem cells found in bone marrow, concentrating the cells into a small injectable volume, and then reintroducing the cells into the area of concern. This process is backed by research and stimulates the body to repair and replace joint tissue that has broken down over time or has been traumatized by conditions such as osteoarthritis, injury or overuse. If you are suffering from knee pain, please contact our office at (516) 419-4480 or (718) 215-1888 to arrange an appointment with our Interventional Pain Management Specialist, Dr. Jeffrey Chacko.